Muscular ‘trigger points’ commonly refer to discrete areas within a muscle which send a sensation of pain to an adjacent area; when pressed upon. Researchers believe that these points consist of tight areas within a muscle which are extraordinarily sensitive, due to a build up of wastes and chemicals which the body produces in response to irritation. These points become so sensitive that they may irritate adjacent nerves supplying that muscle, and then cause pain signals to travel to other areas in the neighborhood. What causes the irritation in the first place? It is widely believed that trigger points arise in muscles which have become injured due to trauma (ie: car accident/whiplash); or recurrent strain (ie: keyboard operators,sportspeople). It is also believed that trigger points can be further perpetuated by fatigue, poor diet, stress, and many other factors. This phenomenon is common in headache and migraine sufferers; especially where long-standing headaches or migraines have afflicted the sufferer. Muscular trigger points around the face, head and neck regions will often ‘refer'(send) pain into neighbouring areas, thereby simulating headaches, or possibly provoking their onset . 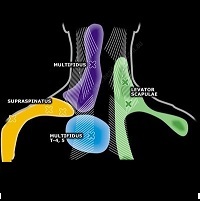 Trigger points causing head pain, often co-exist with joint problems in the head, face, neck, and shoulder regions, and there are many different techniques used to treat them. Neck Problems may contribute to Headaches and Migraines, so it is important to have them professionally addressed. It is also important to investigate for other potential causes, as many cases of Headaches and Migraines have more than one ingredient.